In this modern computer age, when new products are often out of date before you've got them home, it's interesting to reflect upon a time when things didn't wear out quite so quickly and you could expect a second hand purchase to last a reasonable amount of time. Even by those standards, the bells in the old All Saints' church tower can be considered something rather special. The free-standing tower in the grounds of All Saints' churchyard was once part of a Georgian Chapel, built to replace an earlier 16th century black and white timber-framed chapel that had blown down during a gale in 1804. Plans had been in place as early as 1803 to replace the old building, which was in a ruinous and dangerous condition, although work didn't start until 1808. It's not clear where the congregation met in the interim period, but they must have been relieved when the new church was opened for services in 1811. The cost of £4,000 (£288,400 in 2017) was partly funded by subscriptions of £1,030 from local Parishioners, with the balance largely made up by the generosity of Samuel Oldknow. Improvements to the new chapel continued to be made after the main work was finished and in 1816 a substantial investment of £407 (£33,415) was made in the purchase of a peal of six bells from St. Mary's Church, in Stockport, with the further cost of £324 13s 0d (£26,682) for hanging and expenses. 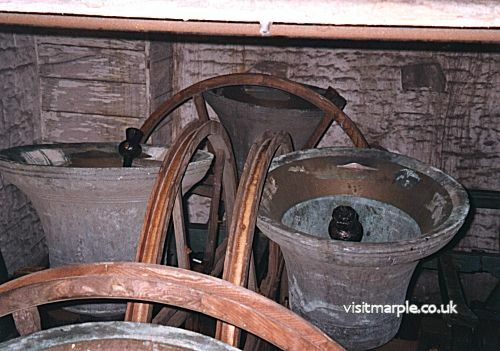 These bells had already seen considerable service and were eighty-five years old when purchased by the trustees of All Saints' for the townsfolk of Marple. They were cast in 1731 by Messrs. Rudhall, a well-known bell founder from Gloucester, and hung in St. Mary's in the same year, replacing an earlier set of five bells. 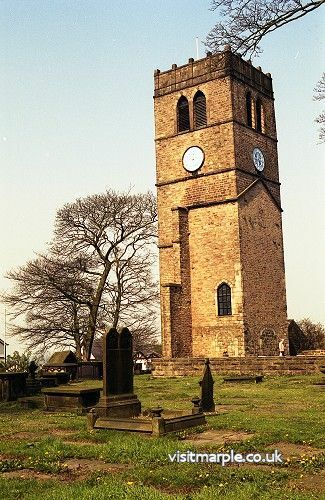 The bells remained in service at the Stockport Parish church until 1810, when the tower was taken down due to a partial collapse and they were placed in storage. The damage was said to have been caused by too many over-enthusiastic bell-ringing sessions to celebrate Nelson's victory at Trafalgar! The trustees appointed for the rebuilding of St. Mary's contracted Messrs. Rudhall for the supply of a new peal of bells to hang in the new church and asked them for a valuation of the old peel in exchange. Rudhall offered 7 guineas per cwt for them, amounting to the total of £400. Owing to the sweet tone of the bells that had been heard ringing across Stockport for several generations, a very strong desire prevailed that they should be retained in the Parish. 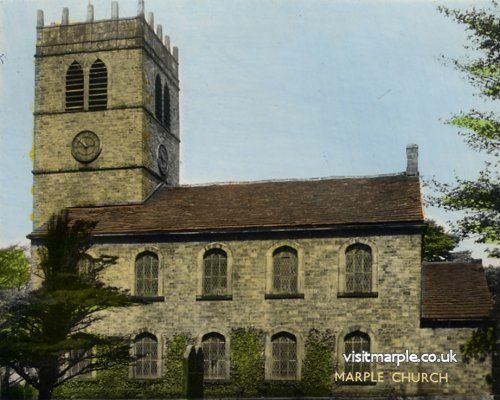 The fact that Marple church had recently been rebuilt with a tower that was suitable prompted the trustees of St. Mary's to hold a meeting where it was unanimously resolved that preference should be given to the township of Marple to purchase them at the price named by Rudhall. An appeal was then made to the inhabitants of Marple and "its vicinity" in March 1816. "The trustees appointed by Act of Parliament for the taking down and rebuilding of the Parish church of Stockport, having made the township of Marple an offer of the peal of bells belonging to the former edifice, earnestly hope that a subscription may be raised equal to the purchasing of them. The sum required is £400, this being the price which Mr. Rudhall of Gloucester, a descendant of the original founder, has offered to take them from the trustees. It is hoped that little urging will be needed to prevail upon the inhabitants of Marple not to suffer these bells to be conveyed away from amongst them forever. The real excellence of their tone must well be remembered by them and scarcely can there be an individual who has not listened to them with feelings such as few would not wish to experience again. The site of All Saints' Chapel is also a consideration that lends weight to this appeal. On an eminence that affords an extensive view of the bold and swelling hills of Derbyshire as well as the more fertile vales of Cheshire, no situation could be better adapted to give full effect to their uncommonly fine tone. From this hill the sound of them will go far and wide and it cannot be doubted that the inhabitants of the other townships when they hear them, will rejoice that their neighbours did not suffer them to be moved forever out of the Parish and will applaud both the spirit and the liberality of the township of Marple." The appeal had such an effect that Samuel Oldknow, Nathaniel Wright of Brabyns Hall and the Reverend C. K. Prescott of Marple concluded the bargain and became personally responsible for the amount. Their security was accepted and on 29th April 1816, Oldknow sent his dray for the tenor and treble and Wright two carts for the remaining four bells. 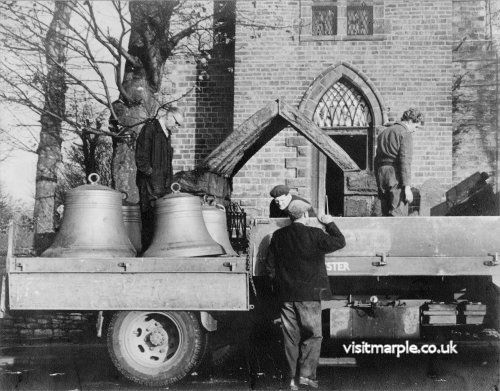 Marple's new bells were rung for the very first time in their new location on 30th June 1816. Prizes were donated and ringers from the surrounding areas competed against each other, turning the day, which included the christening of Miriam Isherwood of Marple Hall, into a really festive occasion. The first list of subscriptions amounted to £528 17s 6d and Marple's inhabitants must have congratulated themselves for having acquired as sweet a peal of bells as is possessed by any church in the country. By the late 19th century All Saints' had been declared a Parish and the growing population created a need to increase space for local worship. Initially plans were drawn up to extend the Georgian Chapel but unfortunately it was found that the structure would not stand up to the alterations required and the decision was taken to build a new church alongside the old. The new church was completed and consecrated in 1880 and, although a bell-tower had been included in the plans, to save on costs it was never constructed and the bells remained in the Georgian Chapel. Not long after the new church was completed it became apparent that problems were developing. By now the bells had been cast for over 150 years and had been in the tower of All Saints' for approaching 70 years. The continual striking of the clappers in one place for all this time had worn a hollow in each bell, to the extent that fears were entertained that they might crack as a result. In 1882 Messrs. Taylor, bell founders of Loughborough, were asked to provide a report on their condition and an estimate for repairing, turning and re-hanging the bells on modern principles. Their estimate of £70 (£3,732 in today's terms) was considered too large a sum to raise at that time and the matter was allowed to stand over until the early part of 1886, when Messrs. Taylor were again consulted. This time their estimate was accepted and after an appeal by the vicar from the pulpit, wardens commenced collecting subscriptions to defray the costs. The Parishioners responded in their usual generous fashion and £90 2s 0d (£5,886) was collected, a sum just a few pounds short of the total costs incurred. Normal service was resumed on Easter Sunday 1886, when the bells were rung by the Hayfield Ringers. For many years both churches were used for services, including weddings, baptisms and funerals but gradually the Old Church lost its appeal as a place of worship and began to be neglected. Eventually it became derelict and sadly by 1964 it had become dangerous and uninsurable. It was decided in that year to demolish the Georgian Chapel but to leave the tower intact to house the bells. In order to make it safe for bell-ringing the bells were lowered down the tower and a new ringing chamber established on the ground floor. At the same time the tower was strengthened and two new lighter bells were cast by Taylors of Loughborough and added to the existing six. 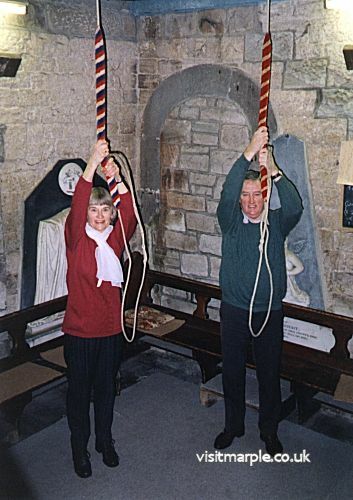 The result was a fine ring of eight bells, which thankfully remain to this day and are used regularly by Marple's own bell-ringers, who always give visitors a friendly welcome at the tower, whether ringers or not. The bells are rung on Sunday mornings from 9.30 am to 10.00 am, with practice most Monday nights between 7.45 pm and 9.00 pm. Practice may be cancelled on some holiday weekends, so it's always best to check first to avoid disappointment. New recruits to the art of campanology are always needed and should anyone wish to try their hand, please contact the Tower Secretary Pamela Andrew on 427 4094. This page appeared as an article by Mark Whittaker in the April 2002 issue of the Community News, in our regular feature "Local History & Heritage with the Marple Website"